Over the past few months I've somehow gotten into the hobby of collecting old video games. Next to cars and other home electronics, video games are probably Japan's most famous export and you can find shops selling them all over the place here. The last time I lived in Japan I didn't buy many games. In fact I've never spent much money on games in my adult life, though my parents used to buy them for me when I was a kid and I certainly played them a lot. The last time I lived in Japan the only games that were for sale were basically expensive new games for whatever the latest system was. Second hand stores in Japan up until recently were almost non-existent and people would usually just throw old things away rather than selling them. That has changed in recent years with the combined effects of economic malaise creating a market for cheaper used goods that still had life in them and a greater awareness of the environmental benefits of not throwing perfectly good things into the trash. The Nintendo Entertainment System that was released in North America in 1985 has basically the same guts as the Famicom, but it looks completely different. 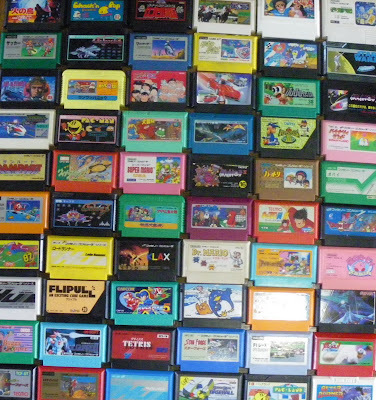 I like the look of the Famicom better, its got some color to it unlike the NES which is basically just a grey box. Because the famicom games are so cheap it is actually less expensive to buy them than to rent a movie, so they have become a fun way for Ena and I to spend a rainy evening. Ena had a Famicom when she was a kid, so its been kind of fun finding all the games that she used to play when she was little. This is one of the other things I like about these games: the cartidges just look cool. They are colorful and the cartoon-artwork on the front looks kind of neat. The NES games, which are all gray, look pretty drab in comparison. These games just scream out "you must have us" whenever I walk through the aisles of the shop. Very simple, but colorful and aesthetically pleasing. 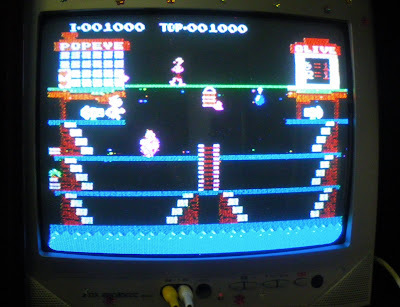 Incidentally Popeye was the first Nintendo game ever made for a home console.